Today one of the leading suppliers to global manufacturers of dyes, pigments, agrochemicals, pharmaceuticals and rubber chemicals has put its first continuous hydrogenation multi purpose BUSS ChemTech Loop Reactor in Operation. 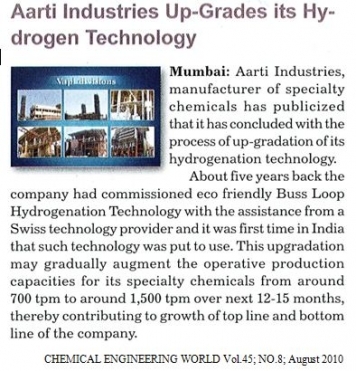 Messrs AIL - today one of the leading suppliers to global manufacturers of dyes, pigments, agrochemicals, pharmaceuticals and rubber chemicals with 16 manufacturing units, a strong R & D department and customers in 60 countries - have put their first continuous hydrogenation multi-purpose BCT Loop Reactor in operation. After years of batch operation Messrs AIL decided to revamp their BCT Loop Reactor for continuous operation. The unique capabilities of this combined BCT Loop Reactor system provides Messrs AIL now with the maximum flexibility and outstanding capacity utilization due to the possibility to run the plant either in batch or continuous mode. Now Messrs AIL produce larger campaigns in continuous mode to shorten total production time and cut down utilities' consumption per tonne and are still flexible to switch easily to batch mode for smaller campaigns in the same plant. This continuous plant design now adjusts fully to Messrs AIL’s production/market demands.